NatWest and Halifax are the latest firms we've found to have sent misleading payment demands purporting to be from independent debt collection agencies. One letter we've seen from NatWest is sent in the name of Unidebt Collections. 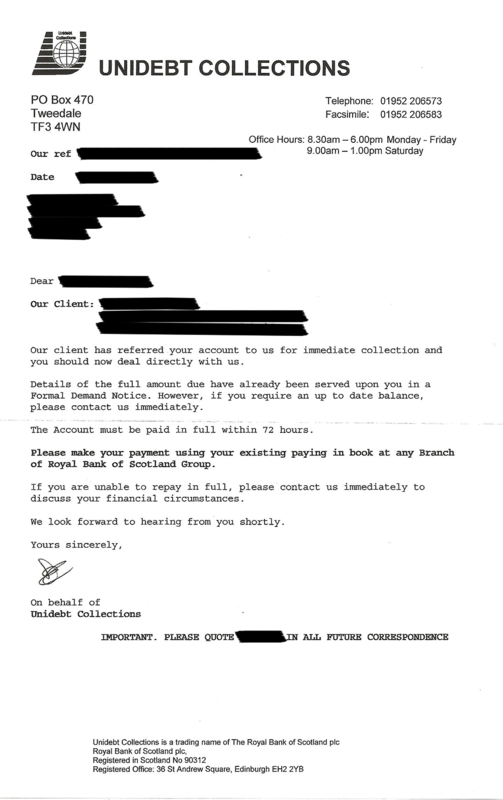 "Our client has referred your account to us for immediate collection and you should now deal directly with us," it states, suggesting it's from an external company. But the foot of the letter reveals Unidebt is actually just a trading name of RBS, NatWest's parent company. RBS says it hasn't used the Unidebt Collections name "for a number of years". The letter we've seen from Halifax is headed Blair, Oliver and Scott Ltd. 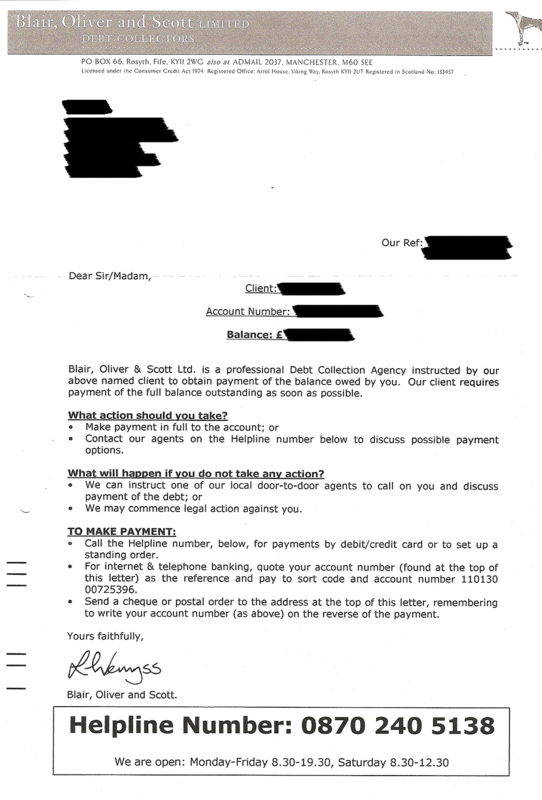 It states it is a "professional debt collection agency instructed by our client to obtain payment of the balance". But when we asked Halifax about the letter, it told us Blair, Oliver and Scott is actually owned by its sister company Bank of Scotland. Blair, Oliver and Scott uses the same initials as Bank of Scotland. Halifax says the debt recovery firm had been used since 1991 to collect debts owed to companies within what is now the Lloyds Banking Group, although it adds that the group stopped using it in November 2013. Here are copies of letters we've received. The one on the left is from Halifax, while the one on the right is from NatWest (click to enlarge). It's the second time this month a Lloyds company has been revealed to have sent misleading letters to people in debt. Two weeks ago, it was revealed that Lloyds had sent letters from in-house solicitors using the name Sechiari, Clark & Mitchell, later renamed SCM Solicitors (see the Banking trio used dubious 'legal' tactics MSE News story). Lloyds said it decided to "phase out" the use of SCM earlier this year. Andrew Tyrie, who chairs the Treasury Committee of MPs, says: "This is very concerning. The sample letter seemed calculated to mislead. Lloyds failed to convince us that this was not the case, or to provide any satisfactory explanation as to why it issued letters in this form, but at least this practice has been brought to an end. "Banks have repeatedly assured Parliament that they are raising standards and now have robust procedures in place to bring consumer detriment to an end. But examples of bad practice like this keep on surfacing." If a company has done what Halifax and NatWest have done by purporting to be a debt recovery firm, you should first complain to the company involved, in this case, the banks. Contact Halifax or NatWest to complain. If you're unhappy with the response you get, see if you can complain to the relevant ombudsman scheme. In this case, you can take your complaint to the Financial Ombudsman Service. A Lloyds Banking Group spokesperson says: "Blair, Oliver & Scott Ltd is a wholly owned subsidiary of Bank of Scotland plc and functioned as a debt collection company collecting debts owed to companies within what is now Lloyds Banking Group in relation to a range of accounts including Bank of Scotland and Halifax overdrafts, loans and credit cards. "It also acted as a debt collection agent for companies outside the Group such as utilities companies. Blair, Oliver & Scott did not undertake any legal recoveries activities and always operated as a debt collection company. It ceased to operate in November 2013 when Lloyds Banking Group re-organised its debt collection processes." An RBS spokesperson says: "Our customers should never be in any doubt about who they are communicating with.Like other banks, we established in-house debt collection agencies, Unidebt was one of those, it is now closed and has not been used for a number of years. "We have reviewed our policies in this area and will stop the use of any solicitor or debt collection brand names in correspondence with our customers that could cause confusion."